Steak a vegetables. Simple, classic and also pretty healthy when you break it all down. This recipe adds a little extra pop to it with the chimichurri sauce but obviously you can adjust that as you see fit. Pretty easy to cook up all together and great to enjoy. Have a great meal. Soak 12 wooden skewers in water for 10 minutes. In a blender or food processor, pulse together basil, cilantro, parsley, vinegar, lemon juice, garlic, shallot, crushed red pepper flakes, and 2 tbsp of olive oil. With motor running, adding 1/4 cup more olive oil until smooth, then season with salt and pepper. Thread onion, peppers, and steak onto soaked skewers (make them extra study by using two skewers per kebab). Arrange skewers on a platter and season generously with salt and pepper. Drizzle with remaining 2 tbsp of olive oil, turning skewers to coat. Grill skewers over high heat 10 to 12 minutes, turning every few minutes to brown on all sides, or until the interior temperature of the steak reaches 145deg for medium-rare (160deg for medium). Let sit 5 minutes. 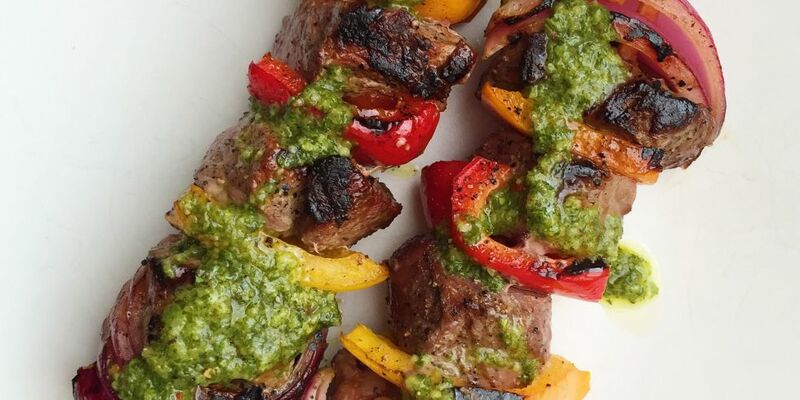 Serve skewers with chimichurri and couscous.